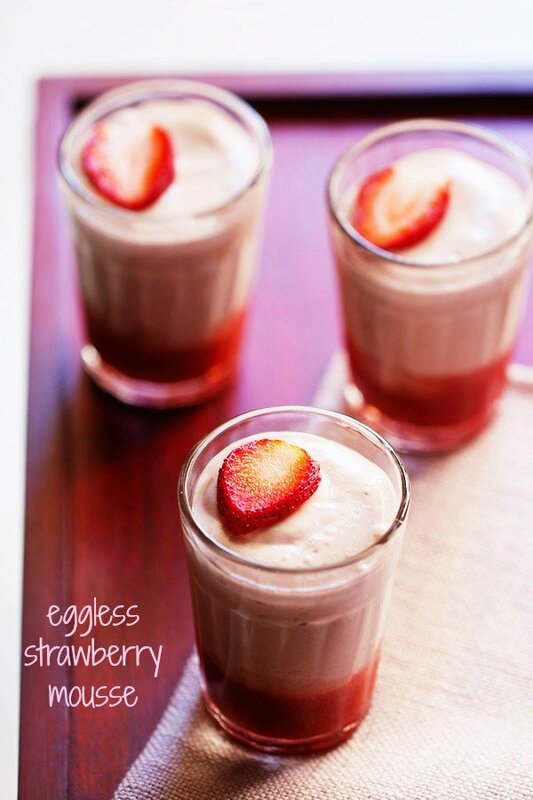 eggless banana mousse recipe - easy and quick recipe of an eggless mousse made with bananas. banana mousse recipe with step by step photos – a quick and tasty no cook dessert recipe of eggless banana mousse. desserts, cakes and muffins are made at home once or twice a week. so when i have time i take pics and update the recipes on the blog. this recipe of making mousse from some fruits is my go-to recipe. i have made mango mousse, strawberry mousse, banana chocolate mousse using the same recipe method. i had seen this recipe a few years back in a book and by now have tried many times making the mousse with fruits. this is a quick recipe and gets done in 15 minutes. the only time taken is chilling the mousse. 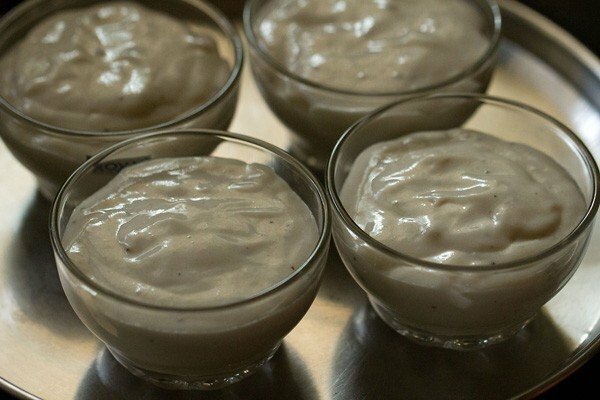 usually i make this banana mousse with leftover amul cream (after adding it to the punjabi gravies) and fruits that are on the verge of getting too ripened. 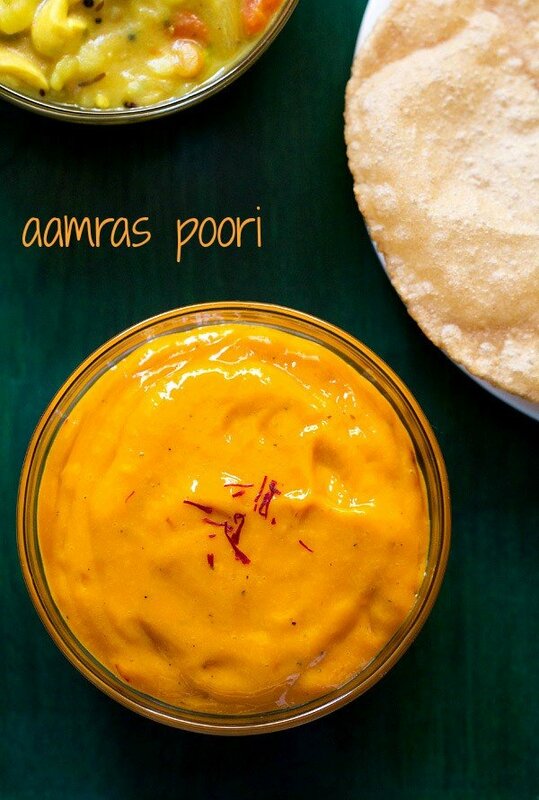 amul cream (which is 25% fat cream available in indian markets) works well in such recipes. if you can get whipping cream, then you can also use that. fruits that can be used are apples, bananas, strawberries, blueberries and mangoes. avoid using melons or citrus fruits. 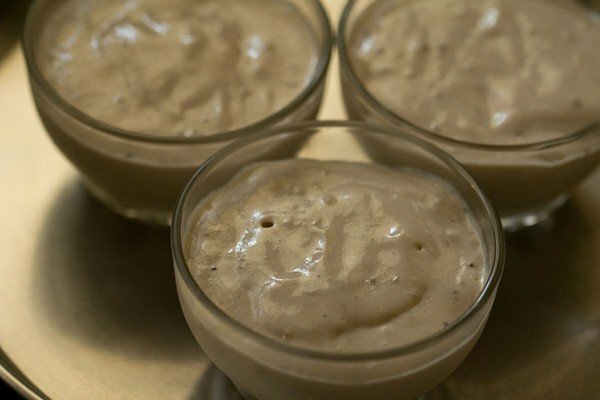 this banana mousse recipe has honey instead of sugar and it really goes well with bananas. if you don’t have honey then add sugar instead. 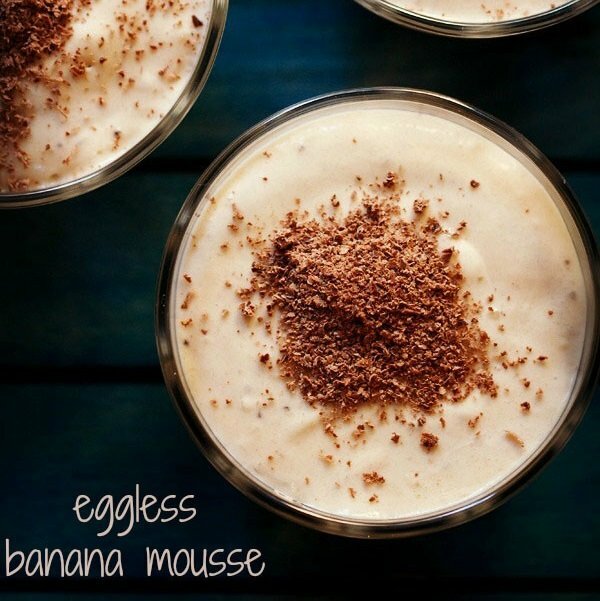 eggless banana mousse can be served plain or topped with some plain banana slices or caramelized banana slices. i topped with grated chocolate. you can also dust with some cocoa powder. peel, slice the bananas and add them to a blender jar along with the honey. also add 3 to 4 drops of lime juice so that the bananas do not get discolored. 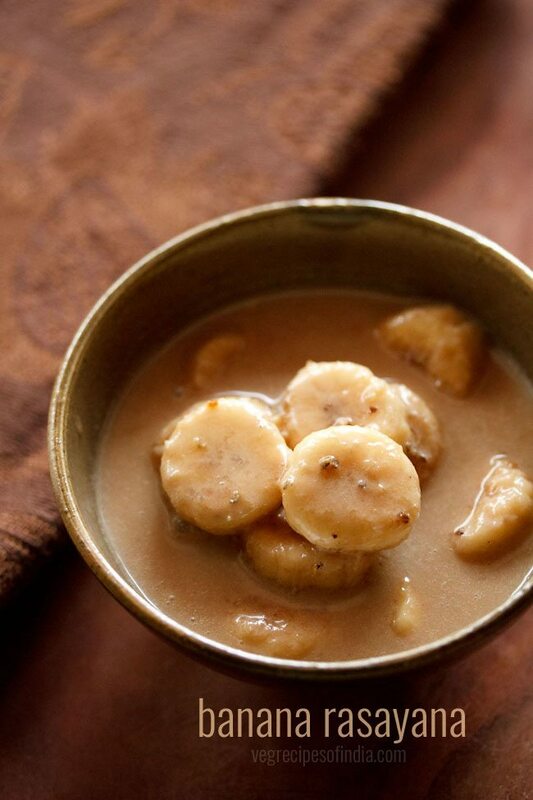 blend the bananas to a smooth puree without any chunks. now add the fresh cream to the pureed bananas. pulse the blender 6 to 8 times so that the cream is evenly mixed with the bananas. now pour the banana mousse mixture in small individual serving bowls or shot glasses. cover them with a lid or aluminium foil and place them in the refrigerator for 3 to 4 hours or overnight for the mousse to completely set. 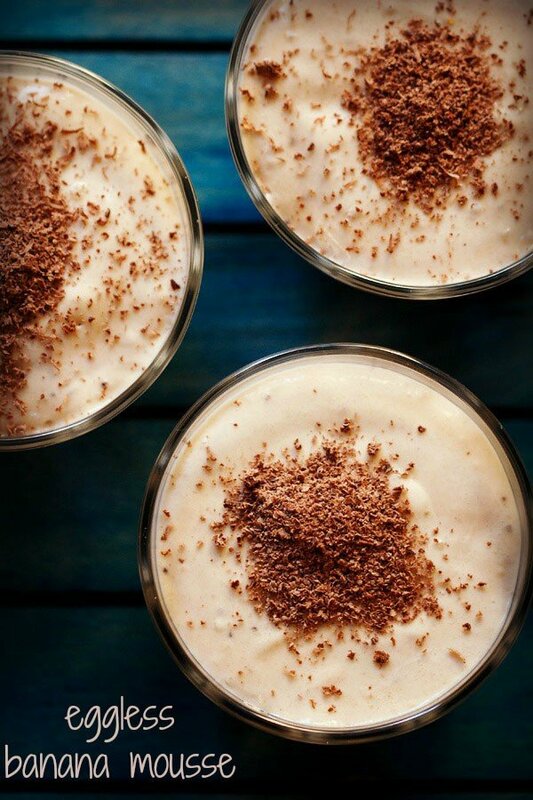 you can serve the chilled egg free banana mousse with some whipped cream, banana slices or grated chocolate. 1. peel, slice the bananas and add them to a blender jar along with the honey. also add 3 to 4 drops of lime juice so that the bananas do not get discolored. i used 400 grams (about 14 ounces) bananas and 2 tbsp honey. the bananas i added were the small variety of 6 elaichi bananas. you can add 4 medium sized robusta like bananas or 3 large bananas. 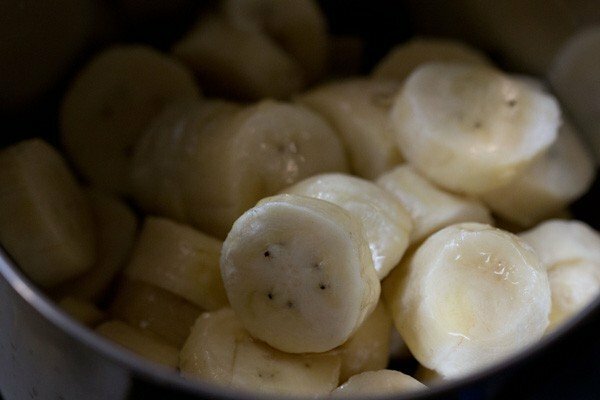 2. blend the bananas to a smooth puree without any chunks. 3. now add a little more than ¾ cup cream or 200 ml cream to the pureed bananas. 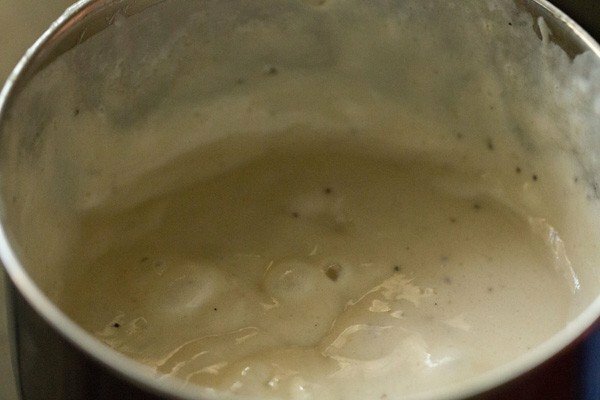 4. pulse the blender 6 to 8 times so that the cream is evenly mixed with the bananas. 5. now pour the banana mousse mixture in small individual serving bowls or shot glasses. 6. cover them with a lid or aluminium foil and place them in the refrigerator for 3 to 4 hours or overnight for the mousse to completely set. 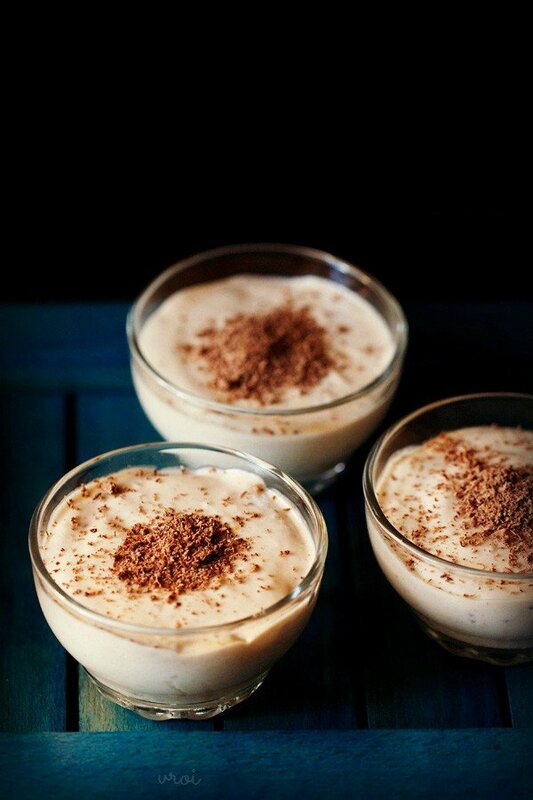 7. you can serve the chilled banana mousse with some whipped cream, banana slices or grated chocolate. I love your recipes and am a great fan of yours.. Just wanted to know if I can add hung curd in place of fresh cream. you can add hung curd. the taste will be different than with cream and the mousse will have sour notes in it, due to the hung curd. but overall the taste will be good. add honey or sugar accordingly. 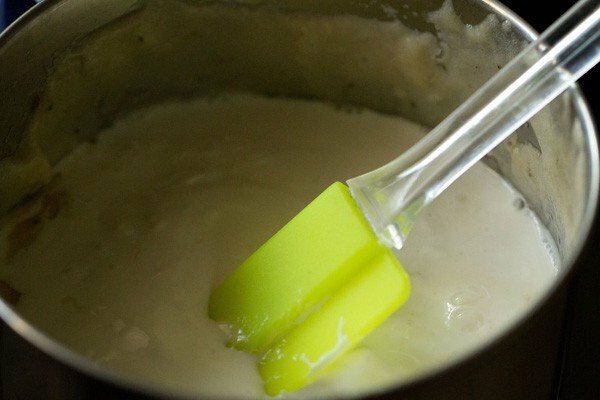 Will Amul low fat(25%) cream do or is heavy cream needed to get the mousse consistency? amul cream works. i use amul cream for all the mousse and panna cotta recipes that i have posted on the blog. 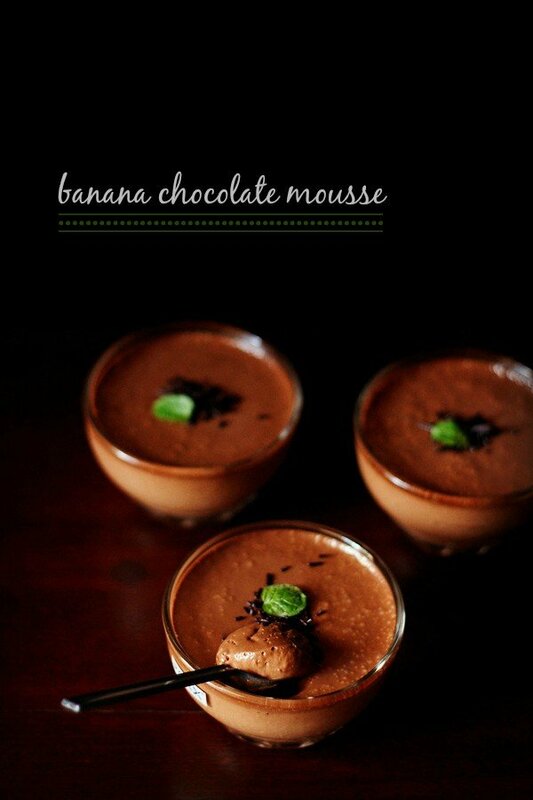 in this recipe, the banana also helps in giving a mousse like texture. 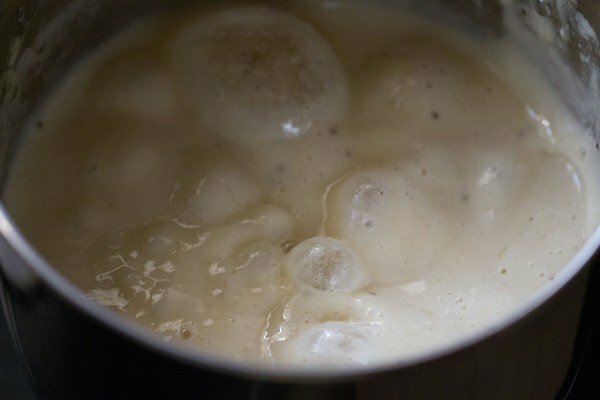 if you can get heavy cream, then heavy cream can also be used in this recipe. You’re truly a kitchen goddess! I have recently started cooking and looked towards your blog to help me out primarily coz it helps me make dishes that are super quick but look as if hours have been spent making them. And I must say that within a week you’ve transformed this newbie to a decent cook! Eternally grateful to you for that. Made the above recipe and mushroom roast yesterday for dinner and it was phenomenal! Didn’t have besan so added rice flour instead 😛 the results were still good! thanks anindita for this kind and motivating feedback. you made my day. 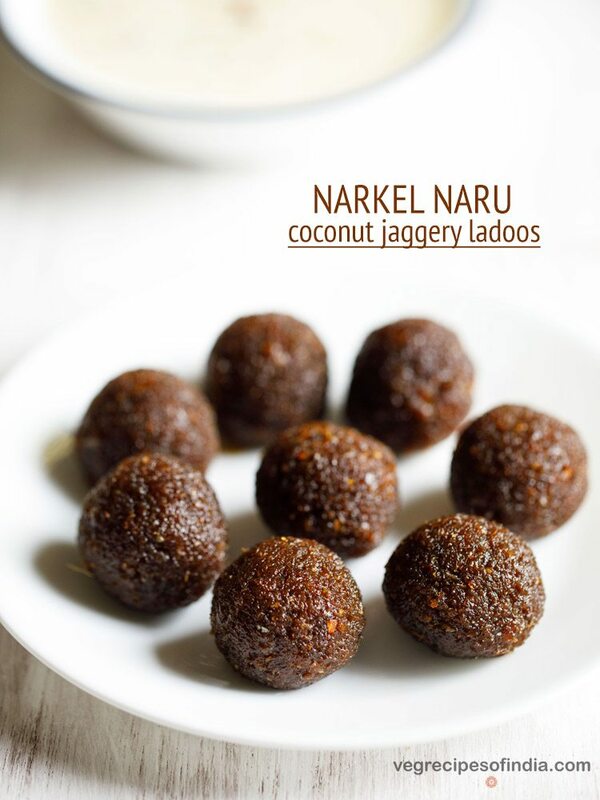 keep visiting and do try some more recipes. Hi dassana, tried the abv recipe and hv kept it in the fridge… it should set by night .. looks yum. hope my son likes it ….. i also tried your chocolate banana mousse.. while melting the dark compound chocolate i added the cream and coffee powder..but the full thing got spoilt.. can u tell me how it must hv happened… probably while i was adding amul cream from the pack a little milk also poured out .. could that be the reason or something else .. one thing im sure is that there was no water in the chocolate vessel …. spoilt meaning what happened. did the mixture looked curdled? the mixture should have a velvety smooth look or appearance. if it looks curdled, then the cream had already got spoiled. don’t eat if the curdling has happened. if not, then you can have as well as serve the mousse. Yes dassana, it looked curdled… i guess you are right the cream must hve been spoilt…. it was 4-5 days olds but kept in the fridge … i know the pack says use it within 2 days after opening … .. hey dassana thanks for your prompt reply … next time i will see to it that i use fresh cream in every dish… thanks a lot ..
regards n tk care ..
thanks for informing marina. next time when you use cream, just smell it. its should have the fresh cream milky aroma. if it smells sour or even faintly sour, then its spoiled. better to use in a few days after reopening. Hello ur recipes are very tasty I just love them, but can I use milk instead of fresh cream and coco powder instead of grated chocolate??? Thank you!!! milk will not give you the mousse like consistency. so milk cannot be added instead of fresh cream. Will definitely try this day after tomorrow. Looks yum! I hv tried ur many recipes and all came out good. Now for this I want to know can I use cream from milk(malai) . One more good thing is u always response to my questions.thanks for that. welcome shallu. thanks for sharing positive feedback. yes you can use but first whip it in the blender. Wow! 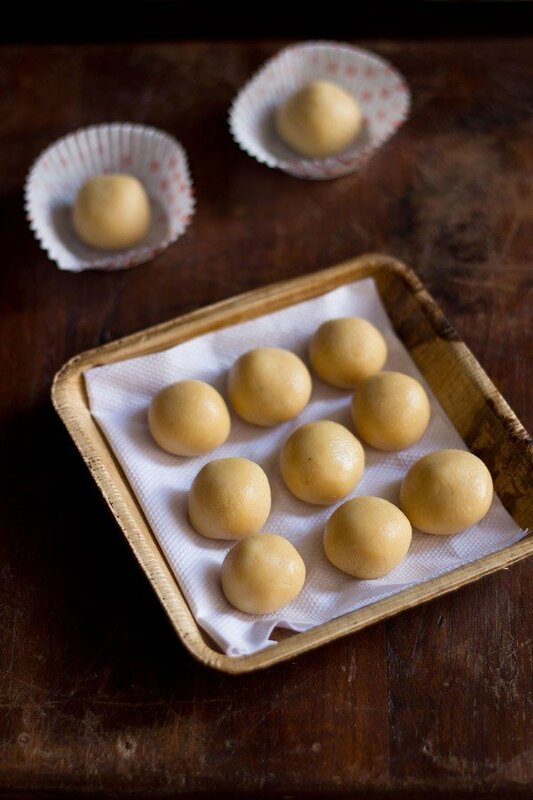 I love love love this website… I have a sweet-tooth and since coming to UK I have been craving good indian sweets for what feels like forever. Thank you so much for these amazing recipes… I am going to try all of them one by one in due time! Oh and all the vegetarian savoury dishes too!! welcome jahnabi. thanks for your kind words. welcome sharvari. thanks for sharing your positive feedback. Oh My! This is one of my favorite dessert and this is the easiest recipe and presentation I’ve seen so far. Thank you Dassana for making me crave. All your receipe are too good.